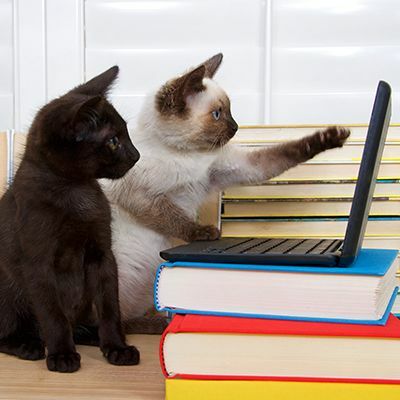 Are you missing out on millions of dollars worth of free publicity for your available pets? A lot of shelters and rescue groups are doing just that by wasting the most valuable real estate in their entire Petfinder.com listings: the first paragraph. The Shelter Pet Project is a three-year, multi-media national Ad Council campaign to promote shelter adoptions. 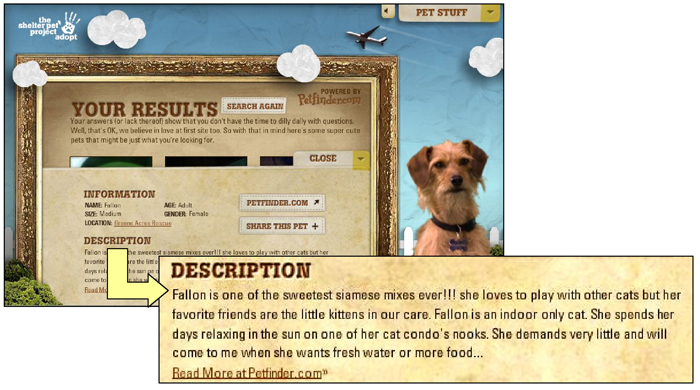 The Project maintains a "Pet Personals" on its website that allows people to search the Petfinder.com database for available pets near them. 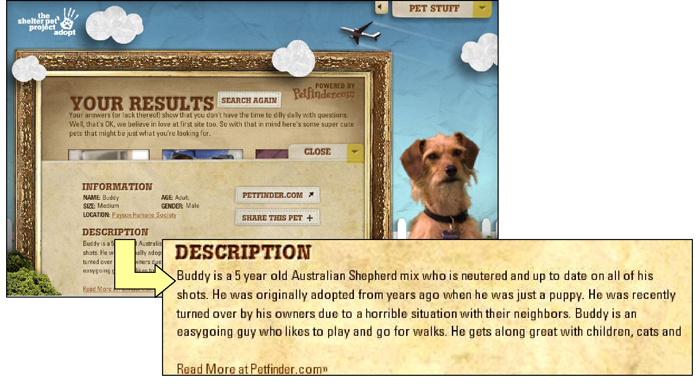 Pets are chosen based on a person's zip code and answers to questions about what kind of pet they're looking for, and those pets' photos are displayed on The Shelter Pet Project website for them to look at. Those first lines are also used as the basis for the daily selection of a pet to be featured on The Shelter Pet Project's Facebook page - listings that average 30,000 or more views every day. They're also sent via email, along with a photo, to the potential adopters. Who would you find more appealing in that format, Hercules and Mimi, or Pan? This not only makes your listing nearly useless for The Shelter Pet Project, it makes it weaker for Petfinder.com, too. As every news reporter and public relations expert knows, the first line or two of any communication is the most critical. That is your golden opportunity to grab people's attention and focus it where you want it. Those are the factors that make people click on a listing and consider adoption. Another problem with many of the listings is that they use that all-important first paragraph to spell out the pet's possible issues, be they behavior concerns or the fact that the pet has special needs of some kind. They may also stress the pet's sad history, including stories of neglect or abuse. It's understandable that those in the shelter and rescue world think this makes the pet more sympathetic, because for that group of people, it does. That's a large part of why you're working or volunteering in animal rescue and adoption in the first place. However, the single thing that causes potential adopters to decide against shelter adoption is that they're concerned that shelter animals are damaged in some way, that they have health or behavior problems that will make them difficult to live with or care for, so to emphasize this goes against your self interest in getting the animal adopted. In research conducted for The Shelter Pet Project, we found that prospective pet owners fall into three camps: Those, like you, who will definitely adopt a homeless pet; those who will definitely go to a breeder or purchase their pet from a retail outlet; and the largest group of all, those who are considering shelter adoption but haven't made up their mind. Of the 23.5 million people who will bring a new pet into their home this year, 17 million of them are in that third group, which we call the "swing voters." It will only take 3 million of those people to make the adoption decision to provide a home for every healthy and treatable dog and cat in America's shelters. By leading with a pet's sad past or current problems, you instantly reinforce the swing voter's belief that shelter pets come with too much baggage, or require too much care or training, to successfully become a part of their family. You not only risk making swing voters decide against that specific pet, but against pet adoption in general. Certainly every organization should give as complete a picture of each pet's personality, health status and needs to every potential adopter. But just as we will put up with the personality quirks, health challenges and bad habits of the people we fall in love with, first we have to fall in love. Use that crucial opening paragraph, especially that first sentence, to give searchers a chance to get a glimpse of who that pet is at heart, their charm and sweetness, their energy and vivacity, their warmth and cuddliness, their shyness and gentleness - whatever it is that makes that pet uniquely him or herself. Only then get down to the facts and figures, hours and location, adoption fees and health or behavior concerns. Give people considering adoption a chance to fall in love.